If you trying hard to rank on Search Engine but not getting the result then Pogo Sticking Can be the reason behind this.Pogo Sticking is worse compared to Bounce Rate.Maybe you ranked high for a particular keyword later you lose that ranking this is also the effect of Pogo Sticking.Most of the new bloggers are not aware of this effect. Have you ever heard about Pogo Sticking? Pogo Sticking occurs when a user performs a search on search engine, clicks on a result and very quickly returns to search result page and enters into another link. This happens when a user performs a search, clicks on a link related to searched keywords if they find that the post is not what they want then returns quickly to search result page. Spammy Title If the title of the blog post is attractive and the post content describes another thing.Simply the content of the blog post does not match with the title. 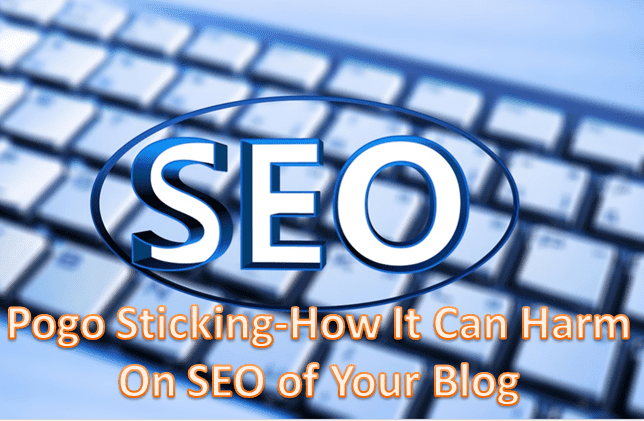 Because of your higher ranking of your blog when users come to your blog and then leave within 5-10 seconds because of your content then Google and other search engines will notice that your page is ranking erroneously and your rankings will drop.Only due to this problem, you will lose the ranking of your blog.